Little pirate captains will be thrilled to set sail in their very own ship swing ahoy! Throw out the anchor and the swing slows down! 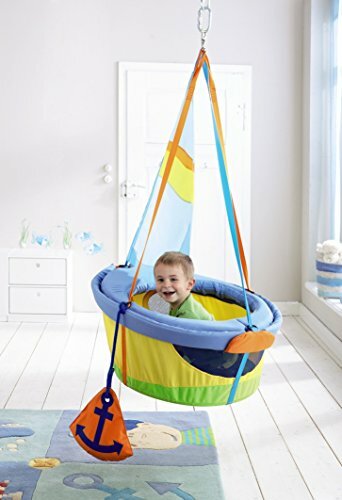 Great for inside or outside fun (but should not be left outside in the elements when not in use). Includes mount for hanging and 2 rope extensions (measuring approx. 16" & 24"). Load: 66lbs. Material: Soft upholstered polyester; frame made of aluminum, sails made of spinnaker nylon. Recommended for ages 3 and up. Sturdy aluminum structure with a weight capacity of 176 lbs. Provides functional decor to any room or play space! 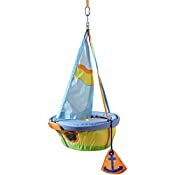 Great for inside or outside fun (but should not be left outside in the elements when not in use). Recommended for ages 3 and up.